Summer is heating up! Well, let’s be honest, it’s summer in Florida and it’s been sizzling since March. The lack of cool weather allows for more summer-like nights by the pool and eating meals outside. 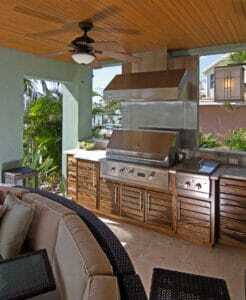 If you have an outdoor kitchen, is it summer time ready? When was the last time you spiced up your outdoor space? Being able to enjoy the outdoors practically all year round means a little more updating from time to time. Giving your outdoor kitchen some new features will give your summer time space new life. The cook does not want to cook alone. If you have the space to add a bar to the front of the grill, do so with reclaimed wood and add some stools so even the grill master can join in the fun. In Florida, we get the scattered thunderstorm quite often, so installing a cover over the cooking area will aid in the unpredictable weather patterns of our sunshine state. If you cook and entertain outside on a regular basis adding a full-size refrigerator/ freezer will pay for itself in no time with the amount of use it will receive. Chill down the drinks and free up space in your indoor refrigerator. The grill is not the only area that receives some spice. Add color to your outdoor space by adding striking seating, fun outdoor friendly art, and colorful pillows. Bright red is always a favorite for outdoors! If you are into cooking with local ingredients, what is more local than growing your own herbs and vegetables? Around your outdoor cooking area, planting a garden will both improve your back-yard oasis and perhaps your cooking! Not feeling the feeling in your outdoor kitchen? Mix it up! If you are finding that a more modern feel is what you’re liking than start by slowly adding more sleek touches with furniture and accessories. Incorporating some of these changes into your outdoor space will have you falling in love with your outdoor kitchen and back yard again.